I've decided that the apple is the ultimate fruit. Your opinion may differ, but hear me out. The apple can be used in savory applications (hello, pork!) as well as sweet ones. It's perfect for condiments, salads, breads and muffins, and heck, even garnishes. What other fruit can say all that? The cherry? Perhaps, but you have to deal with those stinkin' pits. I love berries and find them the easiest fruits (or seeds) with which to work, but, like bananas, they don't usually slide so seamlessly into entrees. In contrast, dates and figs don't necessarily shine in desserts. Your citrus usually has to be peeled, which I find to be a hassle. There's no way around it--the apple is king (or queen)(queeng?)! And what luck--the spherical stunners are in season! I made some muffins, which I'll admit required a bit of prep in chopping the apples, but hey--at least they didn't have to be peeled. That's a fiber bonus, folks. The chunks of pome lent moistness and lots of great flavor, and in combination with the crunchy pecans, created a very tasty morning treat. And hey--if you have an argument for a superior fruit, I'd love to hear it! **There's still some time left to enter my cookie giveaway. Don't miss your chance! Preheat the oven to 425°F. Grease and flour or line 12 muffin cups and set aside. Mix together the flour, baking powder, baking soda, salt, and cinnamon, and set aside. In a separate bowl, cream the butter and add the sugar. Beat until fluffy. Add the egg and mix well. Mix in the buttermilk and vanilla gently. Stir in the dry ingredients and fold in the apple chunks and pecans. Divide the batter evenly among the prepared muffin cups, sprinkling the tops with cinnamon sugar. Bake for 10 minutes, turn the heat down to 400°F, and bake for an additional 5 to 10 minutes, or until a toothpick inserted into the center of a muffin comes out clean. Cool the muffins for 5 minutes in the tin, then turn them out onto a wire rack to cool completely. I actually have to agree with you on this one - apples win. Apples are fantastic! A great ally when baking. I totally agree too! No doubt! You're right - apples are totally versatile. I just wish I didn't have to peel them! Amen, Grace. Apples work wonders for kicking up savory as well as sweet dishes. Can you ship these lovelies to me by the dozen? I agree: apples are the best. And I never peel mine, even for pies. I feel that everyone can use a little more fiber! You make a strong argument, girl. I think pear has a fighting chance, but still it's not the star of the quintessential American pie. These muffins look awesome. Not the arguing type. Love apples, period. I'm definitely casting my vote for apple as Prom Queeng - with perhaps pear as their right hand man. I love those spherical stunners! I think it is pretty perfect too. Apples are really a great fruit. I like bananas too but they don't slip into everything like that apple as you say. Yup the apple wins it. Apples are so versatile! Super yummy muffins. Let's not forget how well cinnamon fits with the reigning king/queen. Oh yeah, apples win, hands down! I can't argue with the power of apples. No arguments here! Apples are my absolute favorite fruit. I eat one every day. No lie. Love these muffins! When it comes to being used in a baked good, I cannot argue with the superiority of apple. These look yummy! Thanks for reminding me of a few lonely apples in my fridge. Muffins are a great idea. I just picked up some apples from a farm in Mendocino County. Might have to reserve a few of 'em for these yummy muffins. That being said, these muffins looks very Mmmmmmm. Apples are definitely a magican and versatile fruit! delicious! i love baked goods with apples. your pictures are lovely! apples are my favourite fruit too. I love cooking with them. especially with apple crumble. yummy. I love apples in bakes, too. Yours looks very soft and moist. Love it! I agree that apples are champions of versatility. And, I love a breakfast muffin with added nutrition like this. They look delicious! Your apple muffin came in the nick of tiime: I have a lot of apples and was going to do a cake with them; I will try your muffin recipe instead! Love apples too, I eat them daily, just wish I had an apple tree in my backyard! Another reason I adore you, Grace...the apple is my favorite fruit too! I love the looks of those gorgeous muffins! I completely agree with you here... sweet or savory, the apple reigns supreme! You won't get an argument from me about apples. Partly because I put lemons in their own special food group, no competing with lemons they make everything taste good (except maybe chocolate). I also agree with you, my dear Grace! The muffins look awesome & tasty,..fab food! Looks like the consensus is that apple rules! Great muffin for all the right reasons. Yummy! I love apples too. They are tasty all the way around. I just recently discovered how wonderful they pair with pork...yum! I heartily agree. But we share the same food obsessions. I am not sure if I have ever made Apple Muffins but I am going to try, these look yummy! 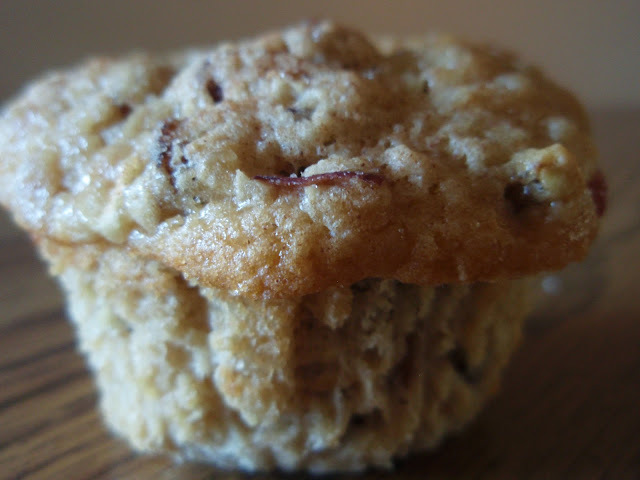 Apple muffins sure sound good to me, and even better with the addition of pecans! this looks so yummy!! i really love how pretty it looks too. I agree, apples are supe easy to work with and give such great flavor!! apples and pecasn! perfect combo!! I also think I want 3-4 of these tasty beauties! Apple wins. Such a very appealing recipe flavored apple. I think I'm going to try this one. Strawberries!! But I have to agree with you in some way, apples are pretty versatile. Absolutely. I love 'em all, and I live in a great state for it! The muffins look fantastic. And if they've got fruit in them they HAVE to be good for you. Right?! Here's another person who agrees with you about apples! I love how applesauce can be used as a fat in baked goods as well. 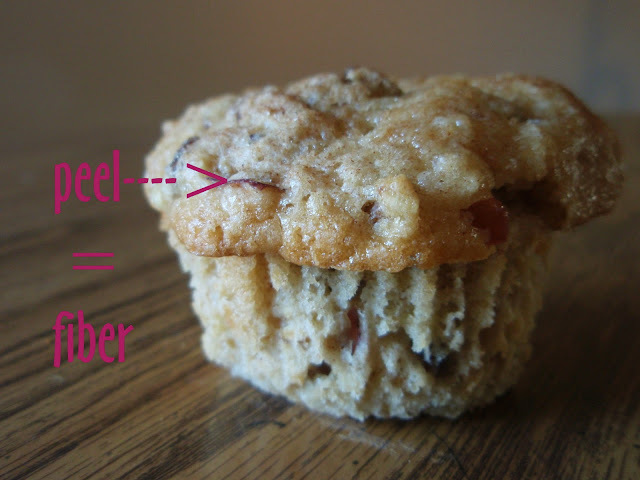 I like the sound of the muffins, especially when I hear that you don't have to bother peeling them. You've been arguing for apples for a long time! These do look fantastic.